The BTN2-0050 is constructed using a custom-made, resonance-free conical inductor to achieve extremely broadband performance. By minimizing the overall inductor size and using proprietary packaging techniques, the BTN2-0050 is a superior option in terms of performance, reliability and ease-of-use when compared to cumbersome user-designed bias tees employing off-the-shelf conical inductors. 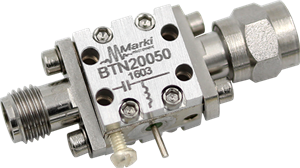 The extremely low cutoff and resonance free operation makes the BTN2-0050 suitable for biasing amplifiers, lasers, and modulators driven with high frequency data patterns.